Available Hand Brushed or Hand Polished. Dimensions: 24"W x 24"D x 32.5-35"H with a seat height of 17.5-20"
The content of recycled aluminum used to make Emeco chairs is 80%. Of the recycled aluminum, half is post consumer (soft drink cans) and half is postindustrial (manufacturing scrap). 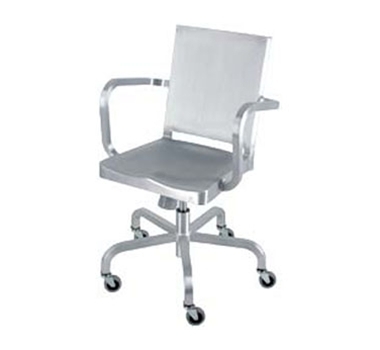 Chairs made out of virgin aluminum have an energy density that is 17 times higher than that of Emeco chairs. Most Emeco aluminum chairs have an estimated lifespan of 150 years or more, making them a sound investment in every way. Please contact sales@theultimategreenstore.com to inquire about availability before placing order.